for the few who care. . .
With E-mail Addresses. . . 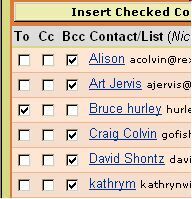 When you forward or send e-mails to your entire address book, it's very important to use the "Bcc:" field instead of the "To:" or "Cc:" field. 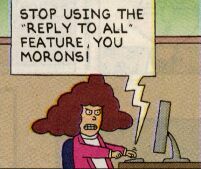 When you send e-mails using the "To:" or "Cc:" field, ALL of the recipients can read everyone else's e-mail address. The reason this is a problem is that any one of these recipients can click a few buttons and add all these e-mail addresses to their own address book. Some people do this automatically without thinking about it; others maliciously use the addresses for spam campaigns. To easily avoid all this and do your part in promoting a happy Internet community, place your own address in the To: field and all the other addresses in the Bcc: field. That stands for "blind carbon copy" and will make the addresses invisible to the recipients. And by sending yourself a copy, you ensure the e-mail was sent correctly. It's just as easy for you and much nicer for your friends. Remember: Use the Bcc: field to send to more than one address. Ninety-nine percent of all "virus warnings," "amazing stories," or "interesting facts" you receive in your e-mail are HOAXES. Simply plug a key word or two from the e-mail into the Snopes search box, and a full report will appear, letting you know if it is real or a hoax. It's fast, easy, and actually fun. Practice these two simple rules and you will be doing a great service to your friends and the Internet community. P.P.S. While you're here, check out this page.